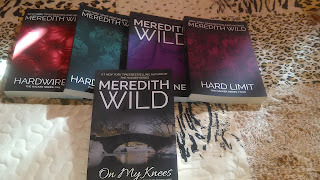 Meredith Wild's Hacker Series & Bridge Series Giveaway! Hello, my page turners and bookends! A few weeks ago, I entered a mega giveaway that Meredith Wild, New York Times Bestseller and author of the wildly popular Hacker Series, was hosting. Out of over 14,000 who entered, I was one of the 300 chosen winners. Imagine how excited I was to get the email that lil' ole me had been chosen as winner. Now imagine that excitement a hundred times over when I actually opened the door to see my postman delivering boxes of books! The Hacker Series has a total of four books. I won ten of each. I also won ten copies of book one to her Bridge Series. So after I took my cut (LOL), I'm now left with nine books of each story from the Hacker Series and nine copies of book one from the Bridge Series. So because Meredith was generous to me, I'm going to return the favor. I won't ask you to jump through hurdles win these books either. All you have to do is leave a comment on this post and I'll randomly select winners. I'll also post this to my Facebook page. Keep in mind, only nine people can win! May the best page turner or bookend win! Meanwhile, I'm about to grab a nice hot cup of coffee and jump headfirst into the Hacker Series! Reviews will be posted for each book as I go along. Disclaimer: OPEN TO U.S. RESIDENTS ONLY! Awesome! Would LOVE to win a set of these books!! Thank you for the chance!!! would love to win a set of Meredith's books if its not too late-thanks for the chance. Is the contest still going on? Hope this is still open! Awesome giveaway! Thanks for the chance! Would LOVE to win! Wow, what a great chance! Thank you so much! This is so generous of both Meredith Wild and you!